IN THE LAST few months we’ve been asking all political parties for their views on the contentious and divisive issues in Irish society such as the Croke Park Agreement and the Property Tax. Though the abolition of the Seanad, as proposed in the current programme for government, is not nearly as controversial as those two policies it is a cause for some debate about whether it is right that there should be an upper house in the Irish parliament. While some would argue the chamber is partly unelected, too expensive and serves very little use in the formulation of policy and laws, others would outline the importance that there be a bicameral (two legislative chambers) system in order to scrutinise the performance of the other chamber and to ensure policies and laws are formulated in the the best interests of the country. Currently, the government has committed to holding a referendum – as is constitutionally required – to abolish the Seanad but this has already been delayed and there have been increasingly louder calls for reform of the upper house, rather than abolition. The current programme for government proposes to abolish the Seanad, are you in favour of this? If no, why and what, if any, alternative would you propose? For a number of years now, Fine Gael has proposed the prospective abolition of the Seanad, as part of a programme of overall political reform. Political Reform is a major priority, as demonstrated by recent measures to reduce the number of TDs in Dáil Eíreann, and to streamline and rejuvenate the way local government operates in this country. Ireland is the only small, unitary state in Europe which has a Parliament with a second house. Other small European countries, such as Sweden and Denmark, have abolished theirs. The proposal to abolish the Seanad was included in the Fine Gael Manifesto, ahead of the 2011 General Election; while Enda Kenny first called for a referendum on the issue in 2009. The Programme for Government includes a commitment to hold a Referendum, to allow the people of Ireland to decide whether or not they wish to abolish Seanad Eíreann. The Taoiseach has indicated on more than one occasion that this Referendum is expected to take place in the second half of 2013. So ultimately, the people will decide. The Programme for Govt proposal to bring forward referendums on a variety of reform issues including the future of the Seanad is supported by the Labour Party. No. Fianna Fáil is not in favour of the abolition of the Seanad due to the failure of the government to implement meaningful holistic reform. We fully recognise that serious questions must be asked about the continued role of Seanad Éireann if, after three quarters of a century, it is struggling to justify its existence. Our proposals put forward a fresh vision for a Seanad that will act as a check on the government, scrutinise legislation, represent voices that would otherwise not be heard in the national parliament and provide a forum for non-partisan meaningful debate and discussion. In short, it gives the Seanad a meaningful role in Irish political life separate and independent from Dáil Éireann. Most European Democracies are Bicameral systems, and while clearly the Seanad in its current reform is undemocratic, unrepresentative and requires abolition, there are several functions which a reformed Seanad could usefully fulfil. It is in that context that we strongly urge the Government to allow the issue of Seanad Reform or Abolition to be debated by the constitutional Convention. We are of the view that this is clearly a useful forum to consider alternatives to abolition, and to consider the very many papers and proposals which have been brought forward over many years, but which have not been implemented. In our view it undermines the work of the Constitutional Convention, by refusing to allow them consider this matter. The public deserve a full and open debate on this matter, and that should not be pre-empted by a Cabinet decision to put the option of Seanad abolition to the people, without offering the option of reform. We asked the Socialist Party MEP Paul Murphy to respond to our questions in relation to the abolition of the Seanad but we did not receive any response at the time of publication. Yes I am in favour of abolishing the Seanad as it is currently constituted. Basically the chamber is elitist in the fact that only certain “qualified” people get to vote in elections and not a mass plebiscite. There is the fact that it actually plays a very minor role in the oversight of legislation. In reality it has become a holding chamber for established parties to put members who were not able to get elected to the Dáil. Thus giving them a public profile and a better chance of election the next time around. I don’t believe a blanket abolition of the Senate is the way to go but I believe it is in drastic need of reform and if reformed, justly and democratically, I would see a future for it. I dislike the way the members are elected – it is not democratic but elitist. It has been, and continues to be, used as a preparation ground for aspiring political party candidates, as retirement ground for those who have served the party and as compensation for those party members who have lost their seats. But it has to be acknowledged that there are Senators who have made excellent contributions and have done great work, particularly in relation to human rights. I think the Taoiseach made some inspired choices in his selection. I would like the electorate to have a say in who are the Senators but I would like to see it as an honour to be selected (but this could be open to abuse) for people who have made significant contributions to Irish society – socially, culturally etc and Fr Peter Mc Verry/Sr Consiglio spring to mind. It is the selection process that needs considerable thought to avoid it developing as it has done. I think it should be a real honour to be a Senator – no salary but a type of stipend. We also asked the independent TDs Shane Ross and Stephen Donnelly to respond to our questionnaire on the Seanad but we did not receive a reply from Ross, while a spokesperson for Donnelly said that the Wicklow TD “has no strong feelings on the Seanad either way”. 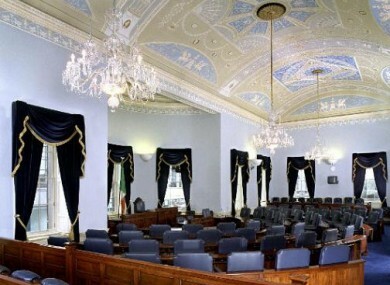 Email “Seanad abolition: Where do the parties stand? ”. Feedback on “Seanad abolition: Where do the parties stand? ”.